Sampling and 4-bit quantization of an analog signal (red) using Pulse Code Modulation. Digital audio is a technology that uses digital signals for sound reproduction. It includes analog-to-digital conversion, digital-to-analog conversion, storage, and transmission. Digital audio has emerged because of its usefulness in the recording, manipulation, mass-production, and distribution of sound. Modern distribution of music across the Internet through on-line stores depends on digital recording and digital compression algorithms. Distribution of audio as data files rather than as physical objects has significantly reduced costs of distribution. From the wax cylinder to the compact cassette, analog audio music storage and reproduction have been based on the same principles upon which human hearing are based. In an analog audio system, sounds begin as physical waveforms in the air, are transformed into an electrical representation of the waveform, via a transducer (for example, a microphone), and are stored or transmitted. To be recreated into sound, the process is reversed, through amplification and then conversion back into physical waveforms via a loudspeaker. Although its nature may change, its fundamental, wave-like characteristics remain unaltered during its storage, transformation, duplication, and amplification. All analog audio signals are susceptible to noise and distortion, due to the inherent noise present in electronic circuits. Digital audio is the technology of representing audio in digital form. The digital audio chain begins when an analog audio signal is converted into electrical signals—"on/off" pulses—rather than electromechanical signals. This signal is then further encoded to combat any errors that might occur in the storage or transmission of the signal. This "channel coding" is essential to the ability of the digital system to recreate the analog signal upon replay. An example of a channel code is Eight to Fourteen Bit Modulation as used in the audio Compact Disc. An analog signal is converted to a digital signal at a given sampling rate and bit resolution; it may contain multiple channels (2 channels for stereo or more for surround sound). Generally speaking, the higher the sampling rate and bit resolution, the greater the fidelity, as well as higher the amount of digital data. Analog noise floor in the capturing circuitry, and have inherent capacitance and inductance that limit the bandwidth of the system, and resistance that limits the amplitude. Digital quantization noise in the capturing circuitry, and sampling rate limits the bandwidth and its bit resolution limits the dynamic range (resolution of amplitude creation). In order to achieve better fidelity, higher quality components are required, which increased overall cost. A digital audio signal starts with an analog-to-digital converter (ADC) that converts an analog signal to a digital signal. 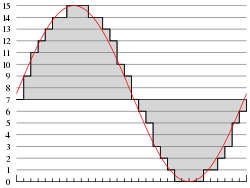 The ADC runs at a sampling rate and converts at a known bit resolution. For example, CD audio has a sampling rate of 44.1 kHz (44,100 samples per second) and 16-bit resolution for each channel (stereo). If the analog signal is not already bandlimited, then an anti-aliasing filter is necessary before conversion, to prevent aliasing in the digital signal. (Aliasing occurs when frequencies above the Nyquist frequency have not been band limited, and instead appear as audible artifacts in the lower frequencies). 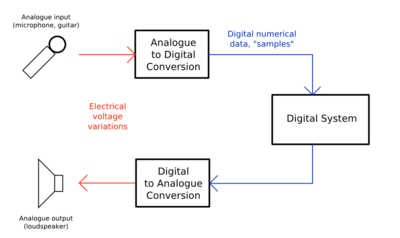 An overview of the digital <-> analog conversion process. Some audio signals such as those created by digital synthesis originate entirely in the digital domain, in which case analog to digital conversion does not take place. After being sampled with the ADC, the digital signal may then be altered in a process which is called digital signal processing where it may be filtered or have effects applied. The digital audio signal may then be stored or transmitted. Digital audio storage can be on a CD, an MP3 player, a hard drive, USB flash drive, CompactFlash, or any other digital data storage device. Audio data compression techniques—such as MP3, Advanced Audio Coding, Ogg Vorbis, or Flac—are commonly employed to reduce the file size. Digital audio can be streamed to other devices. The last step for digital audio is to be converted back to an analog signal with a digital-to-analog converter (DAC). Like ADCs, DACs run at a specific sampling rate and bit resolution but through the processes of oversampling, upsampling, and downsampling, this sampling rate may not be the same as the initial sampling rate. Commercial digital recording of classical and jazz music began in the early 1970s, pioneered by Japanese companies such as Denon, the BBC, and British record label Decca (which in the mid-70s developed digital audio recorders of their own design for mastering their albums), although experimental recordings existed from the 1960s. Although the first-ever digital recording of a non-classical music piece, Morrissey-Mullen's cover of the Rose Royce hit "Love Don't Live Here Anymore" (released 1979 as a vinyl EP) was recorded in 1978 at EMI's Abbey Road recording studios, the first entirely digitally recorded (DDD) popular music album was Ry Cooder's Bop Till You Drop, recorded in late 1978. It was unmixed, being recorded straight to a two-track 3M digital recorder in the studio. Many other top recording artists were early adherents of digital recording. Others, such as former Beatles producer George Martin, felt that the multitrack digital recording technology of the early 1980s had not reached the sophistication of analog systems. Martin used digital mixing, however, to reduce the distortion and noise that an analog master tape would introduce (thus ADD). An early example of an analog recording that was digitally mixed is Fleetwood Mac's 1979 release, Tusk. Fidelity evaluation is a long-standing issue with audio systems in general. Although audio signals can be measured and analyzed by specialized instruments to more exacting standards than can be done by ear, such measurements do not always reveal whether certain sounds are evaluated as "good" or "bad" by any given listener. Parameters that pertain to audio quality include hearing capabilities, personal preferences, location with respect to the speakers, and the room's physical properties. Of course, subjective evaluation is not unique to digital audio. However, digital audio adds more items to the debate, such as lossy compression algorithms and psychoacoustic models. Naturally, any digital bus (such as USB, FireWire, and PCI) can carry digital audio. Borwick, John. 1996. Sound Recording Practice, 4th edition. Oxford: Oxford University Press. ISBN 0198166087. Ifeachor, Emmanuel C., and Barrie W. Jervis. 2002. Digital Signal Processing: A Practical Approach, 2nd edition. Harlow, UK: Prentice Hall. ISBN 0201596199. Rabiner, Lawrence R., and Bernard Gold. 1975. Theory and Application of Digital Signal Processing. Englewood Cliffs, NJ: Prentice-Hall. ISBN 0139141014. Stanley, William D., Gary R. Dougherty, and Ray Dougherty. 1984. Digital Signal Processing. Reston, VA: Reston Pub. Co. ISBN 083591321X. Watkinson, John. 2005. The Art of Digital Audio, 3rd edition. Oxford: Focal Press. ISBN 0240515870. Introduction to Computer Music: Volume One, Chapter Five: Digital Audio. This page was last modified on 23 October 2017, at 19:39.